The Maldivian army has arrested a senior judge in the criminal court for alleged corruption. A government statement said the judge, Abdulla Mohamed, had allowed "his judicial decisions to be determined by political and personal affiliations". The arrest comes after he released an opposition leader who had been detained for allegedly defaming the government. Judge Mohamed has made no comment on his arrest as yet. There were minor protests in the capital, Male. 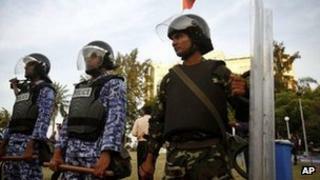 Opposition activists said that the arrest was in retaliation for the judge ruling that the detention of opposition leader Mohamed Jameel Ahmed one day earlier was illegal, AP news agency reported. The supreme court, the prosecutor general's office and judicial services commission have demanded Mr Mohamed's release, calling his arrest illegal. A court hearing is being held in the capital, Male, to debate the detention. The government statement accused Mr Mohamed of failing to respect the principle of judicial independence and also refers to him "repeatedly releasing opposition figures brought before the courts for serious crimes". A source in the government claimed Judge Mohamed was deliberately obstructing cases involving members of opposition parties. Gassan Maumoon, the son of the former President Maumoon Abdul Gayoom, was also reportedly released after Judge Mohamed intervened in the case in November, ruling that he was unlawfully detained. Mr Maumoon was arrested on charges of attempted murder after allegedly throwing a wooden plank at protesters during a demonstration. Local media reports say all court hearings have been suspended in the wake of the arrest. Judge Mohamed's conduct has previously been a source of controversy. In 2005, the attorney general at the time, Hassan Saeed, expressed concerns to the president over reports alleging that the judge asked an underage victim of sexual abuse to reenact her attack during a court hearing. However the accusation was never proved.